The fiddle led off with "Chicken Reel." The four couples began to sway with the rhythm, anticipating the caller's first directions. Assured all were ready, the caller chanted with the music. And hold your holts and gone again. The dancers followed his directions, their feet beating out the rhythm of the music. As you would eight till you get straight. Warming up to the music, the head man let out a whoop. The contagious rhythm infected the ring of people tucked out of the way around the living room. Most clapped in time to the music, while a couple men stood up in the double door to the kitchen as the dancers got into the dance and clapped and stomped loudly with their right foot. The fiddle and guitar played the melody over and over as the dancers jigged and whirled through the dance. Wave that pretty girl back to me. All four couples in turn led the others through the dance. Ten to fifteen minutes later the caller finished. If you want anymore you can call it yourself. While most dancers sat down, one couple executed a few more extra fast steps before the fiddle finished off the song during an evening of old style Ozark square dancing. Square dancing and round dancing were the two kinds of dancing in the rural areas of the Ozarks in earlier days. In the local language, anything not danced in a square was round dancing. 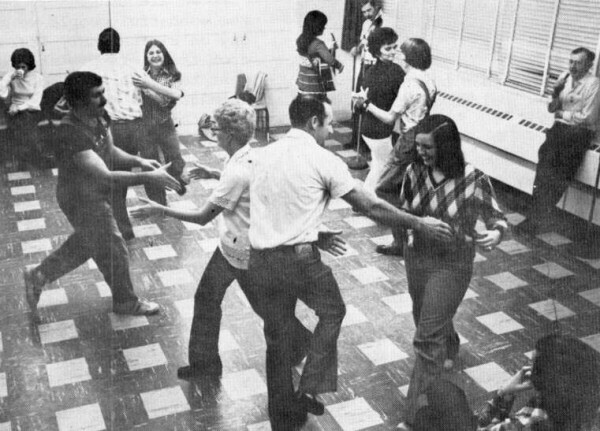 Round dancing did not mean folk dancing, but social dancing where a couple dances alone, doing the popular dance of the time, the waltz, two step, and even more modern jitterbug and twist. Square dancing is a folk dance developed in America from adaptations of the English running sets and the stately French cotillion which later developed into the less formal quadrilles, and in America, the Virginia Reel. In square dancing four couples are in square formation, dancing always as a group. Under the direction of a caller, or as he was formerly known, a prompter, they perform intricate figures and patterns, often changing partners, to the rhythm of stringed instruments playing lively tunes. The old-time square dancing of the Ozarks brought here by early settlers from the mountains of eastern Tennessee and Kentucky followed the basic folk pattern. The old way was to have each of the four couples in turn lead the others in the same dance. Couple number one would go as directed by the caller to other couples in turn to "Take a Little Peek" or lead the others in the "Wild Goose Chase." Then couple number two would lead in the same call, going to the other three couples in turn. Depending on the dance, sometimes couples would stand for periods of time doing nothing, waiting their turn while the other couples were dancing. The jig step which is characteristic of some dancing in this area, probably developed as a way of participating or filling the time so that everyone was dancing all the time. 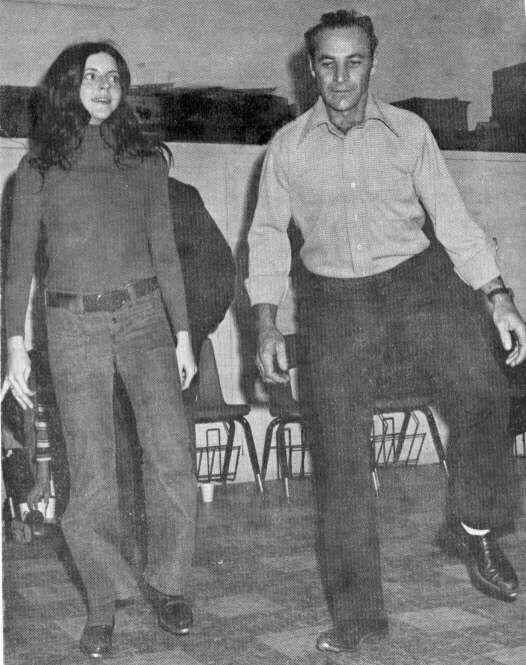 Square dancing in more recent years, especially Western style, involves all dancers most of the time and has developed some more involved patterns and movements. However, the dances usually do not last as long nor allow dancers as much individuality. The old time way, with each couple taking turns leading and going through several variations, could last twenty minutes if the caller had an energetic group. Also, to vary the dance a caller with experienced dancers might call a different dance for each couple. Couple one might do "Cowboy Loop," couple two "Sally Goodin," couple three "Roll the Ball" and couple four "Form a Star" with a variety of figures between the couples. 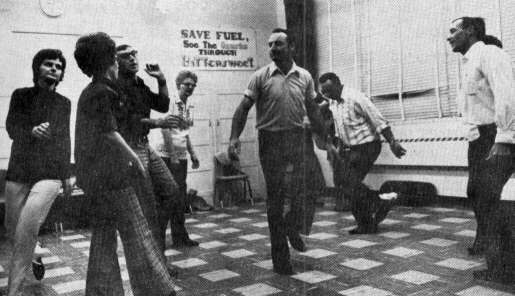 A letter from Charlie McMicken gave the BITTERSWEET staff the needed push to learn the old way of square dancing. 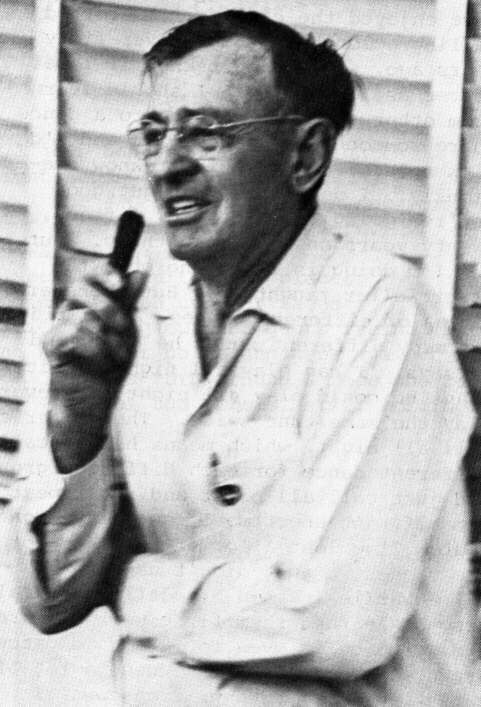 "You wish to write articles about some of the dying arts," he wrote, "and a suggestion of mine would be an article about square dancing. I am referring to the old-time jig style, foot stomping, hillbilly type which is possibly unique to the Ozarks. The calls, the dances, the fiddle music have surely come from rural regions." This letter began a whole chain of events with Charlie and Dorothy telling us about square dancing and Charlie teaching us how to do it with the help of the Ridgerunners, four couples who still carry on the older tradition of dancing. Years ago the square dance was held in the dancers' homes. Charlie and Dorothy frequently had dances in their home. They converted their living room into a dance floor by taking down the stove pipe and pushing the stove out of the way, making a larger floor space. Local musicians and neighbors would gather at the house for a night's entertainment. Usually there would be just one set going, but sometimes there would be a set in the living room and another in the adjoining dining room with the caller standing in the doorway directing both sets. When the dance was over, the McMickens simply put the stove back in place until it was their turn to host another dance. "Break that swing and balance eight - As you would eight till you get straight." During the depression, the McMickens and their friends helped relieve the boredom of many teenagers who had no cars nor money by inviting them to the house and teaching them how to square dance. Although this did help to entertain the teenagers, many of the adult dancers met against some interference from local churches, who at that time frowned on dancing. 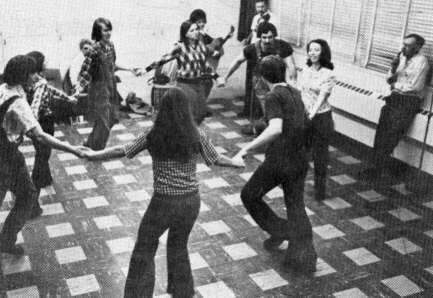 Any dancing was suspect, but square dancing was considered especially bad. The bad reputation was probably associated in the beginning with drinking. The preachers and many people in the community seemed to think that where there was dancing, there was liquor, and that the square dancers were "leading the children astray." But Dorothy explained the views of the group she danced with. "We didn't have much else for entertainment and we'd get together as people will do, you know. There were no strangers and there was no liquor allowed. That was understood." Charlie added, "With us at least. There were some places that weren't so particular, but with us there was no liquor." The places that weren't so particular were usually the locations of dances held outside on a platform, frequently seen at picnics or other public places. It was the brazen people that attended dances there, those who did not care about what others thought. People trying to maintain a reputation would not have danced on a platform years ago, though they do now. Nor is the objection to square dancing all in the past. Some churches and preachers today still share the feelings of the churches fifty years ago, teaching the evils and future consequences of dancing. ""For all I know they may be right, but we've enjoyed it," Charlie said boyishly. 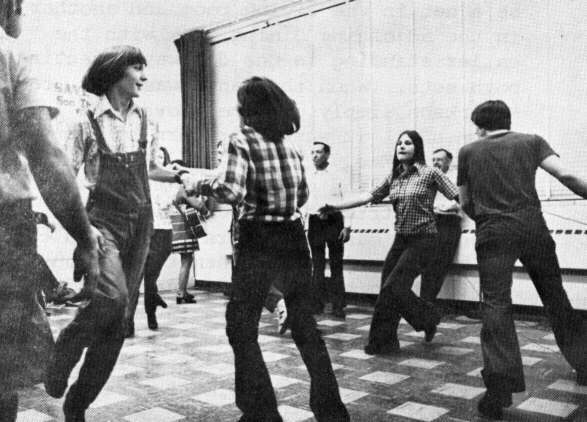 The enjoyment square dancing gave everyone was obvious in the attire of the people years ago. The women dressed up in their good Sunday dresses and the men wore their nicest pair of overalls. They did not have colorful costumes like the Ridgerunners wear today to special performances. But now when they hold neighborhood dances or dance with us, they wear casual dress but have added taps to their shoes which add a little something extra to the music. 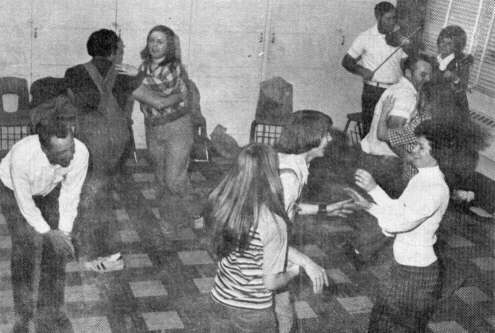 A special feature to the square dance was the person known as the clapper and stomper. He would clap and stomp loudly with the music, helping the dancers keep time. Sometimes several persons would clap and stomp. Each person in the room adds to the total effect of the dance--the chant of the caller over the musical lead of two or three instruments with the clappers' and dancers' feet supplying rhythmical background, all punctuated frequently by whoops from the men and laughing exclamations from the women. The onlookers are pulled into the rhythm by clapping, swaying, tapping feet or even jigging on the side lines. Bill Fenton helps the dancers keep in time. 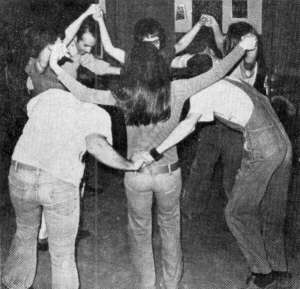 The old way of square dancing provided the neighborhood with many nights of good entertainment. The dancing was so entertaining and enjoyable, in fact, that several times Charlie and Dorothy literally danced all night. "We've got home in time to do morning chores a time or two. Isn't that awful?" he laughed. 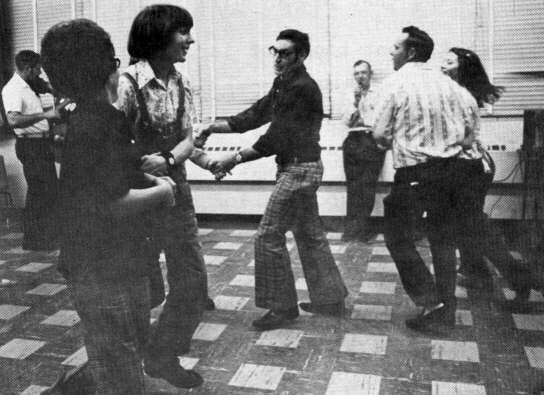 A great part of the enjoyment of square dancing is the lively tunes of the musicians in the room playing tunes like "Up Jump Trouble" and "Chicken Reel." Charlie Mc and dancers in general much prefer live music to records. "A record some way or another is not right," Charlie said. "I've tried calling from records with the best fiddler in the U.S. but I can't quite get with it. I get close." The dancers also dance with more spirit with live musicians who play to suit the caller and dancers. In Ozark square dancing the fiddle is the lead instrument. Its high pitched tone adds a special flavor to the music. Sometimes it seems that the fiddle is telling its own story about what happened at "Cripple Creek" or what "Dusty Miller" did. A good fiddler can really make the old fiddle tunes come alive, transferring his enthusiasm to the dancers. The fiddle is played by ear and often held on the shoulder instead of under the chin like a violin. For best results a fiddle needs a second instrument for background and fullness. A guitar, mandolin, and the banjo are all used as seconds. The second, following the rhythmic lead of the fiddle, makes a foundation of chords for the fiddle to carry the melody. The piano was sometimes used as lead instrument when there was nO fiddle player available. But Charlie said, "A fiddler is always best. We've danced to others, but a fiddle is the instrument for square dancing." The musicians also enjoy square dances. It is a time when they can meet their friends, play their favorite tunes, and show their expertise on their instruments. They play different tunes all evening, seemingly without tiring, even playing or practicing between the dances, staying as long as anyone still wants to dance. There are hundreds of old fiddle tunes used for square dancing which have been handed down and played by ear. Certain favorites like "The Eighth of January,'' "Turkey in the Straw" and "Lil' Liza Jane" have been written down in music books, but some lesser known ones have been forgotten because today very few young musicians play the old tunes. The most noticeable regional difference in this square dancing is the jigging where each one dances as he or she wants to. Some shuffle to the music, some step around in time to the music and some do a more difficult step often called a jig. Especially good dancers do a still more difficult back step, dancing backwards with a shuffle. The jig is similar to clogging which goes back to pre-classical period to the folk dancing of Ireland and other places. It is a fast step--first on one foot, then the other. The weight is transferred in the air as in running. The step itself varies from region to region and dancer to dancer. The movement is done in the legs with the bent knees absorbing most of the movement. The best dancers are described as smooth. The hips do not move a great deal and there is not much up and down movement of the body. The dancers are loose and relaxed in the knees and feet as well as the upper body. They like to wear taps on toes and heels to emphasize the step. When we asked Charles Holloway of the Ridgerunners how he did it, he replied, "I don't know. I just do it." His daughter Cindy was more explicit. She said she alternates feet in a sort of hop-step on one foot, sliding backwards almost in one motion, hop-step on the other, sliding backwards, rapidly shifting weight in time to the beat of the fast music. Another dancer might give different directions for there are many styles of doing this. None of the Ridgerunners do it exactly alike. The dancers jig most of the time. Their own individual step is especially noticeable when a single dancer is being circled by the others as in "Rattlesnake Shake" or "Bird in a Cage." This is a chance for him to dance alone and show what he can do, rather than stand still while everyone else is dancing. The normal figures of the square dance itself require a lot of exertion. The almost constant jigging added to this makes all but the most hearty want to sit out some of the dances. Dorothy said, "It keeps you limber and is good exercise." Charlie grinned, "And lots of fun." The caller in the square dance is the most important person on the dance floor. He is responsible for the dancers dancing correctly and keeping in time with the music. He should call in a musical voice, speaking loudly and distinctly so that the dancers understand exactly what figure they are to do. The caller should be a leader forceful enough to direct the dancers, because he is the one who determines the dance he calls, whether there are variations in the dance and the length of the dance. "The old way of dancing was for the caller to be in the dance," Charlie explained. "He wasn't off to one side, but he was right in the set and he called and danced at the same time. I don't pretend to do that anymore. I stay to one side now. At that time, of course, instruments weren't amplified. No one had electricity and a fellow didn't have to holler loud anyway to get above the music. Of course, now I stay on the side lines and use the mike. I have to get above the amplified instruments. Oh, I'm not near as good on the mike as I would be without the mike and I'm nowhere near as good as I was years ago." Charles Holloway and his daughter Cindy jig to the last strum of music. The caller is to be in time and in tune with the music so that when a phrase of music begins, a phrase of calling begins also. A good caller uses patter to make his calls more complete. In many dances one direction is all that the dancers need to do a figure. But the caller puts in a lot of extra words, or patter, to help keep the rhythm for the dancers. "Now the only thing I ever said in through there to do any good was just, 'Once and a half.' The rest of it was just throw-in-stuff, see? And there's a dozen different ways of calling 'Once and a half,' and they all are adding the patter in there. "See what I mean? There's just dozens of different ways of saying that same thing. It all means the one thing 'Once and a half.' That's all you ever did tell them, too. A lot of patter adds to the rhythm of the dance. It just helps the thing along some way or other." Charlie went on to tell why he started calling. "I started calling probably when I was about twenty years old. We needed someone to call. A bunch of us got together and there was no one to call. 'Now you can,' 'No, I can't either,' 'Well, you can,' 'No, I can't either.' And it just went the rounds and finally, 'Well, I'll try it.' And that's where it started with me. Charlie McMicken's calling of old-time square dances is recorded on the sound sheet on page 59. "I have to use the mike now to get above the music." I've enjoyed the calling. I started calling a long time back, over fifty years ago. Oh, I don't know if I get better as I go along. I should learn from other callers. I'd go to a dance where someone else is calling and I'd pick up some calls I didn't know previously. I don't know, to get good you're going to spend ten, fifteen, twenty years on the whole thing. But all I'm doing is repeating what the other feller taught me. But there are dozens of different dances. Ask a fiddler how many different tunes he knows and he says, 'I an play all night,' which means he could play all night and never play the same tune twice. The caller can call all night, which means he can call a different dance for each different group and just call all night and not repeat himself. At one time I could have done that. I've lost a lot of calls--a lot of the dances we just didn't use." Charlie learned his calls from callers who learned them fifty years before him. The calls even for the same dance are never the same for he uses a lot of variations. We have written down his calls as he called them for the Ridgerunners and us to dance. There is a glossary of terms, directions for the common figures, followed by several dances enjoy by the Ridgerunners and BITTERSWEET dancers. "Promenade all around the world. Across the hall - name for C 3. 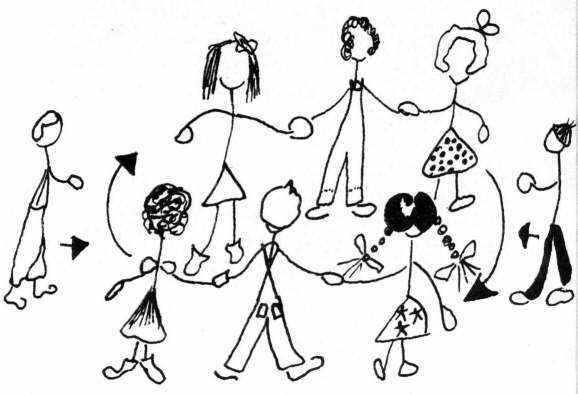 Bird and crow - bird is the L, crow the G.
Corner - L to the left of G.
Couple up 4, 6, 8 - Lead C holding hands go to C 2; join hands and all 4 circle to the left. With 6, add C 3. With 8, add C 4. Form a star - G's 1 and 3 (Or L's) hold right hands across clasped right hands of G's 2 and 4 and dance to the left. This is right hand star. For left hand, reverse, clasping left hands, thus moving to right. Grandmaw - term for another L, often meaning L to the left. Home position - position G starts the dance--lst, 2nd, 3rd, or 4th. During the dance L often changes her position when she changes partners. She always starts and ends in home position. Lady go gee and gent go haw - L goes to the right and G to the left. Lead in 6, 8 - While circling with 4, lead G drops hand of L 2; C 3 joins the ring. C 4 joins ring by breaking in between C's 1 and 3. Left hand lady - another term for corner. Left wing - another term for corner. On the left by your left wing - give left hand to corner, move around and give right hand to partner. Opposite - name for C 3. Partner- the L or G you're dancing with. Partners often change throughout the dance. Promenade left - G takes corner L and promenades. Rights and lefts all around the ring -alternate hands with other dancers, L's going left, G's to right until meet partner. Sally Goodin - one of the other L's, usually the corner. Sashaway - G and L meet each other going around back to back to original position. Sashay - used in Scale the Wall - two lines of three dancers facing each other rotate clockwise changing places. Square - eight dancers standing in position of a square. Swing - hold partner in dance position and circle in place. Taw - another term for G's partner. Two hands across - in star formation, dancers join hands and circle. Two way swing - same as swing. Whirl - another term for swing. Your partner wrong - left hand to partner. Ridgerunners teach BITTERSWEET dancers the movement of Once and a Half. All join hands and circle eight. Eight hands around the ring. The 4 C's join hands in set formation & circle to the left. Variation: Places all and to your places And straighten up your faces. Ladies facing out and gents facing in, And hold your holts and gone again. The L's turn around & face the outside of the circle, still holding hands. Swing like swinging on a rusty old gate If you ain't too late. And meet your honey with a shoe fly twist. 1. C's face their partners; clasping right hands they move around 1 full time, then half way around again, extending left hands to corner. Drop partners hand. 2. Clasping left hands with corner, they move all the way around, then give right hand again to partner. Drop corner's hand. 3. G's continue to right & L's to left all around the circle, extending alternately left and right hands to the other dancers until they meet their partners. You swing Sal and I'll swing Kate. Hurry up boys, don't be so late. And a post in the hole and a hole in the ground. 1. Meet your partner & swing. 2. G's then swing all L's in the set in turn, moving to the left until they meet their own partner. Hurry up boys and swing grandmaw. Swing Sally Goodin, promenade your taw. And swing that gal that you love best. And swing the gal that you love least. And swing that gal in calico. Promenade the next you meet. Tongue a-hanging out and feet a-draggin'. And you never come down. And make that big foot jar the ground. And meet the next one, say good bye. And meet your partner and promenade. 1. Meet your partner skating fashion, right hands together, left hands under. 2. Dance to the right back to G's home position. Promenade that pretty little girl. Promenade all around the world. Promenade all around the floor. Promenade home for there ain't no more. Promenade that pretty little thing. Promenade all around the ring. Promenade home cause there ain't no more. First couple out and dance by the right And left hand too. Dance again as pretty as you can. 1. C clasp right hands facing each other & move around each other half way to the left, changing places. 2. They drop hands & face each other again. 3. Then clasp left hands & move to right, past each other to original places. 4. G holds L's right hand in his left & leads her around outside the circle to right. 5. When they reach the opposite C, they drop hands. G goes between C 3 while L continues around the outside. 6. They meet at the home spot. And little boy doe and oh, by golly, and oh, by Joe. And left hand back and how are you? Don't forget that opposite lady. And hurry up boys don't be so long. 2. Both C's face their partners. They clasp left hands & move around each other until they meet their corner. 3. They clasp right hands of corner, dropping partner's hand & move around corner. 4. They give their left hand back to their partner & move around partner half way until G's meet each other. 5. G's clasp right hands as do L's clasp their hands across G's in star formation. 6. Circle to the right in star formation. 7. Dancers switch to the left hand & move to the left in star formation. 8. Break the star, give right hand to the corner, move around. 9. Left hand to partners, move around. Doe-si-8 as you would 4. This can be done with 6 or 8, doing the star formation with all C's. One more doe and on you go. Directions are directed to men unless specifically stated. Follow the leader in a wild goose chase. G 1 leads the other three holding hands in a snake-like dance in the middle of the floor as he cuts a figure 8. This time G 2 leads the others in a figure 8. And lead in six and don't you mix. First old boy, follow the leader in a wild goose chase. With 3 couples in a ring, G 1 leads in a figure 8. And follow the leader in a wild goose chase. And the next old boy follow the leader in a wild goose chase. Couple up six and don't you mix. And lead in eight when you get straight. Continue dance with 4 couples, each gent leading. Bird in the cage and three hands round. L 1 goes inside the circle while the other 3 circle around to left while holding hands. Bird hop out and crow hop in. L 1 rejoins the circle while G 1 goes inside the circle. On to the next and lead in six and don't you mix. G rejoins circle & the 2 couples go to C 3 & couple up 6. L 1 and G 1 repeat all steps with 6, then 8 circling. Repeat dance with each C leading. Lead C goes to each C in turn, circling 4 hands each time. And cheat or swing and swing or cheat. And back to your partners and everybody swing. 1. G 1 goes across the hall, sasha-ways & then swings L 3 as G 3 goes across the hall & does the same with L 1. 2. G's go back to their partners & everyone swings. To the right and all four gents go to the right. And back to your partner and everybody swing. To the left and all four gents go to the left. Don't forget that cheating in the game. Couple up four over here and four over there. And you know where and I don't care. And doe-si-doe and little boy doe, etc. You know where and I don't care. When you get straight. Repeat dance with side G's leading. Lady go gee and gent go haw. 1. G 1 leads his partner up the set and through C 3. 2. L goes all the way around outside the circle to the right, the G goes to the left. 3. When they get back home, everyone swings. Opposite gents go across the hall and sashaway the opposite girl. Back to your partner and everybody whirl. And sashaway the right hand girl. And back to your partner and everybody whirl. Back to your partner and everybody whirl. Repeat dance with G's 2, 3, & 4 leading. First old boy in a cowboy loop. 1. C 1 goes under the clasped hands of C 2, holding hands until they get under. 2. C 1 separates, L going around G, & G around L. L 1 still holds hands with G 2 and G 1 holds hands with L 2. 3. C 2 ducks under their clasped hands. 4. The 2 couples form a circle again. Second old boy will follow suit. 1. C 2 leads in a cowboy loop going under the arms of C 1. Circle 4. Couple up four and on to the next And lead in six and don't you mix. First old boy in a cowboy loop. Second old boy will follow suit. Third old boy fell in the coup. 1. With 6 circling each couple in turn does the cowboy loop. 2. C 1 goes between C's 2 & 3. 3. C 2 goes between C's 3 & 1. 4. C 3 goes between C's 1 & 2. Fourth old boy has got the roup. 1. Repeat cowboy loop each couple in turn dividing the ring. 2. C 1 goes between C 3. 3. C 2 between C 4. 4. C 3 between C 1. 5. C 4 between C 2. Couple up eight when you get straight. Repeat dance with each G leading. Swing those ladies to the center and back. G's hold their partner's hand & parade them to the center of the circle, then back, walking backward. G's form right hand star. And skip that partner and take the next. 1. Still holding star formation circle right. 2. G's pass their partner & take the next L. G 1 takes L 2, etc. G hold L's waist. L holds G's waist. 1. G's let go of left hands & swing partners with arms still around waists. G's circle in place, L backwards around him. They turn once & a half. 2. L's form right hand star. 3. Circle to left in form of a star. You hold your holts and gone again. 1. L's let go their right hands. G's swing the ladies backwards once & a half. 2. G's form a left hand star. And on the left by your left wing. And rights and lefts all around the ring. Repeat dance 3 more times until G's have their own partner. Couple up four in the middle of the floor. Right hand across as you go through. Left hand back and how are you? 1. C 1 and C 2 form right hand star. 3. Continuing circling to right, G's hold both hands, L's hold both hands under the G's hands. Still holding hands, duck under the arms of the G's. Hurry up boys don't be so long. Break the circle. G takes L to left by his right, then his partner by his left. Repeat all steps with 6, then 8. Continue dance with other G' s leading. And it's out in the center and you cut a figure eight. 1. c 1 leads C 2, all holding hands, in between C 3 around L.
2. Back to the middle of the floor G 1 leads all in a figure B. And out to the center and you cut a figure eight. Repeat the figure this time going around G.
Balance six as you would eight. 6 couples do the doe-si-doe. And on to the next and round the lady with a rattlesnake shake. Continue the figure leading 6. Couple up eight when you get straight. Doe-si-doe with 8 Repeat dance with other C's leading. Next time you meet her you meet her in the hall. C 1 goes through C 3, L going right, G going left. They go all around the circle back home. And promenade left all around the world. Repeat until get own partner. Repeat dance with each C leading. To the right and swing with a two way swing. Back to partner, everybody swing. Across the hall and swing that gal from Arkansaw. Back to your partner and swing your taw. To the left and don't forget to swing grandmaw. Back to your taw and everybody swing. Repeat going to all L's. Repeat with 3 G's, then 4 G's. Repeat with each G leading. G 1 leaves his partner standing to left of G 2 & goes on to C 3 & the 3 circle. And couple up four in the middle of the floor. He takes L 3 by the hand & goes to C 4. 4 circle. And leave those girls and go on home. Leave L 3 on left of G 4 & go home alone. And forward up and back. The side G's, holding hands with a L on each side, go forward until they meet and back. Forward up and sashay round. 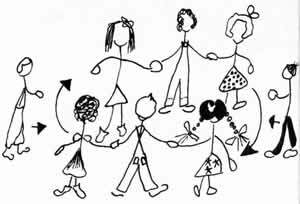 Go forward again & all 6, still holding hands, rotate to the left, then move back, changing sides. Watch the two little boys scale the wall. G's 1 & 3 change places. Forward up and sashay around. Repeat so G's are in home position again. And promenade left all around the hall. Repeat until G's have their own partners. Repeat with each C leading. Couple up four in the middle of the floor. And ho, swing the opposite. And ho, swing your own. The call is to G's 1 & 2. And ho, swing the opposite. Sashaway the left hand girl. And sashaway all round the hall. Sashaway as directed, end by going to the right, sashawaying each L in turn until you meet partner. And take a little peek. C 1 goes to C 2. L 1 goes halfway around G 2 while G 1 goes halfway around L 2, still holding hands. C 1 pauses in this position & "peeks" at each other behind C l's backs. And back to the center and shake your little feet. C 1 returns to center & looks at partner. Around that couple and peek once more. Back to the center and circle four. Leave that couple and on to the next. Break the circle & repeat with C's 3&4. Repeat dance with all C's leading. Two little sisters form a ring. L 1 & L 2 join 2 hands & circle. Back to your partner and everybody swing. Rights and left all around the ring. And meet your honey with a two-way swing. Three little sisters form a ring. L's 1 & 2 circle with L 3. Repeat with L's 1, 2, & 3 circling with L 4. Repeat dance with each L leading. First couple up to the center and back. Dance between the opposite couple, L to right, G to the left outside the circle back home. Up to the center and back. L goes between G's 2 & 3 & the G goes between C's 3 & 4. L goes between C 2 while G goes between C 4. Repeat until regain own partners. Repeat dance with each couple leading. Wave the ocean, wave the sea. C 1, holding hands, followed by C 2, G behind G, L behind L, go between C 3, G to the left, L to the right in single file. Partners rejoin in center & swing when they meet. Wave that pretty girl back once more. And wave that pretty girl back to me. C l leads as before followed by C 2 & 3. Have that pretty girl back to me. Repeat dance with each couple leading. Or we'll be here till broad daylight. Wild cats squall and a house cat jumps through a hole in the wall. 2. Lead G breaks the circle, the rest holding hands in a line. He leads all other dancers under the clasped arms of C 4. 3. After all the dancers have gone under, G 4 turns so his right arm is over his left shoulder, still holding on to the left hand of his partner behind. 4. Lead G circles around in position & goes under the arms of the next two dancers (C's 3 & 4). 5. G repeats cutting off one dancer at a time until all dancers have their right arm over their left shoulder, holding the left hand of dancer behind. 6. G joins hands back across his shoulder with L 4, thus winding up all the dancers. 7. In this formation, continue circling to left, then backwards to right. Walk that squirrel right off that limb to a hole in the wall. Hold tight if it's all right. Break that swing and balance eight. Join hands and circle to the left. Ladies to the center back to back. L's go to the center and stand facing out with backs together. And gents run around the outside track. G's continue circling to the left single file. Skip that partner, take the next. G's pass their partner and take next for new partner. Now you're home you balance all. And on to the left by your left wing. And right and left all around the ring. Repeat with each new partner until meet original partner.